Agua fresca, or "fresh water," is served throughout Mexico and is a perfect summertime cooler. Purée melon in a blender until smooth. Strain through a sieve and discard pulp. 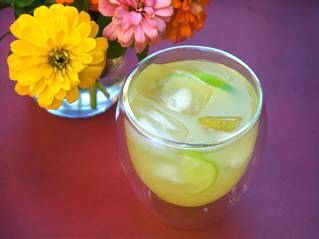 Pour the melon juice into a pitcher and stir in the water, lime juice, and sugar. Serve over ice, garnished with mint sprigs or extra chunks of melon. Culinate editor's note: Because granulated sugar won't dissolve easily in cold liquid, you may wish to replace the 3 tablespoons sugar with a simple syrup of sugar dissolved in boiling water. Agave nectar, of course, is already liquid. Read more about hydration in Marissa Lippert's "Hydration and health."